The HKTDC Education & Careers Expo is a platform for the dissemination of information on education, training and career development. It caters to the growing demand for the need to obtain and upgrade qualifications and find a satisfying career path that offers the opportunity for advancement. 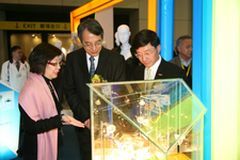 The 2008 edition of the event was attended by 505 educational institutions as well as public and private-sector employees. They included participants from Australia, Canada, Chinese mainland, France, Germany, Hong Kong, Macau, New Zealand, Singapore, Switzerland, Taiwan, United Kingdom, US and a first-time exhibitor from Saudi Arabia. Hong Kong has long put great value on the acquisition of educational qualifications. The drive to better oneself has been behind the city’s tremendous growth and economic success over the years, and remains as strong today as it did 50 years ago. The HKTDC Education & Careers Expo, which is now in its 19th year, has tapped into this demand and given educational institutions and employers unprecedented access to potential students and employees. Among the huge numbers of students and job seekers who came through the doors of the 2008 Expo were those looking for full-time tertiary education, those already in employment seeking evening and other part-time courses to upgrade their existing work skills, as well as graduates looking to step on to the career ladder or those already in employment looking to move in a new career direction. 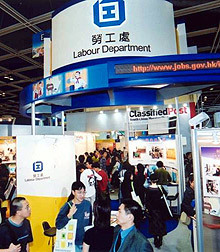 The Expo is divided into two sections – Education and Careers, with the Education section sub-divided into ‘Hong Kong’ and ‘outside Hong Kong’. Last year, 432 universities, polytechnics and other teaching institutions including language centres, student counselling organisations and vocational training bodies participated, while 73 commercial enterprises, government departments, semi-government organisations and professional associations took part in the Careers section looking for high-calibre employees. The Expo adds value to the fair experience by highlighting certain economic sectors that are enjoying good growth and development in the current climate. Created in 2006, the Financial Planning Industry Zone has enjoyed a great deal of attention and will return again in 2009. In addition, a number of themed days also turn the spotlight on areas of potential interest through various activities. In 2008 these were the education themes of US Study Day, Chinese Mainland Study Day and Continuing Education Day, while the careers theme day focused on the Financial Planning industry. Running throughout the fair are a number of other events such as seminars, forums and career video sections on a variety of topics, all of which help to draw visitors to the Expo. Put yourself on the platform! 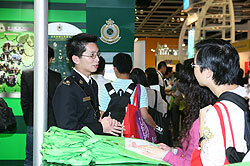 The HKTDC Education & Careers Expo is the premier event of its kind in Asia. It is organised by the Hong Kong Trade Development Council, which has an excellent record in providing efficient and effective platforms for the promotion of exhibitors’ services and products. 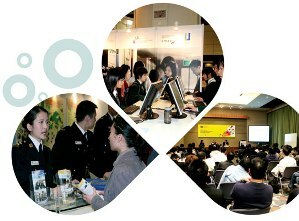 The Education and Careers Expo 2008 was held between 21 – 24 February 2008 at the Hong Kong Convention and Exhibition Centre. This four-day event allowed attendees to grasp the most updated information on education, training opportunities and current market trends, which are vital in attaining a competitive edge in Hong Kong's vying environment. 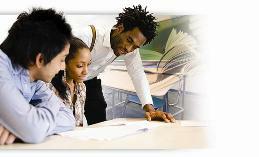 Furthermore, lifelong learning and career planning are their important keys to success. 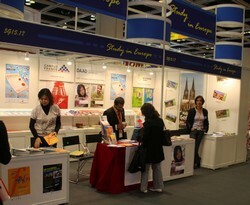 The Education and Careers Expo 2008 was undoubtedly a fabulous channel to achieve all these purposes at just one stop. It was a premier event of its kind in Hong Kong where exhibitors met top-notch students and enthusiastic working individuals who were ready for challenges. At the Expo, visitors were able to recognize the changing demands of the global market and the pressures it has on educational requirements. World-class education experts and career consultants provided the most up-to-date information in all relevant fields and this proved to be extremely beneficial to all the visitors. Hong Kong, China (Hong Kong S.A.R. ).